I can’t tell you the number of times I’ve heard this statement or something like it. It usually accompanies a conversation which involves telling a homeowner that their wood stove installation needs to be altered or corrected in some way during a WETT inspection. But why is that conversation taking place? Let’s back up. What exactly is a WETT inspection? A WETT inspection is a review of the components of a wood-burning system to ensure that they are installed correctly, are maintained in good working order, and that all parts of the system are compatible with one another. It is also a review of clearances between the components and adjacent combustibles like the walls, floors, and anything else in the area that could catch fire. Wood-burning appliance - a factory-built device with which one heats their home by burning wood or wood pellets. These include wood-stoves, wood-burning inserts, pellet stoves, and wood furnaces. Certified appliance - any appliance that has a certification sticker, or documentation that clearly applies to the appliance and shows the required clearances and installation standards. Uncertified appliance - any appliance that does not meet the criteria for a certified appliance. An uncertified appliance must be installed to the standards of B365. WETT Certified - Inspectors are certified by WETT Inc. We do not certify devices. We inspect and report what elements are or are not in compliance with requirements. It is not a pass/fail situation. Certification sticker - this sticker is applied to every certified wood-burning appliance by the manufacturer. It shows several pieces of information including the required installation clearances. The listed clearances on a sticker supersede the requirements of B365. For the purposes of this article, I will be describing a typical inspection for a stand-alone wood stove. The process for other types of appliances will be similar, but will potentially vary in some areas. 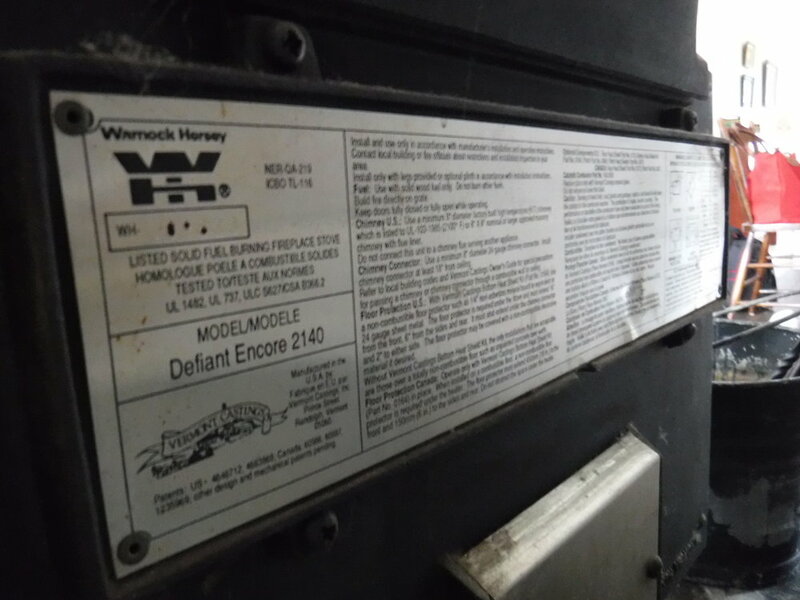 When I am inspecting a wood-burning appliance, the first thing I look for is the certification sticker. If one is present, then this is considered a certified appliance. I can then measure the installation against the requirements as listed on the sticker. If there is no sticker, then it is considered an uncertified appliance and I must measure against the requirements in B365, which is much more strict and requires much larger clearances. Once I determine the standards applicable to the appliance (sticker, B365, or both) I measure all the clearances. I need to know the distances between each face of the device and the closest adjacent combustible surfaces: floors, walls, ceilings, furniture, stored fuel, etc. I then review the floor protection. Not only do we need to consider the heat created by the fireplace, but we have to be prepared for sparks and embers which may fall out when the door is opened. I then inspect the appliance itself to make sure it is in good working condition. I check it’s structural integrity, door glass, fibreglass door seals, etc. When I am done with the appliance itself, I move on to the flue. Flue pipes have their own clearance and installation requirements which may be more or less stringent than the device to which they are attached. A critical area is the point at which the flue transitions to the chimney at a wall or ceiling. The chimney will either be factory built (stainless steel, typically) or built on site. A WETT inspection doesn’t technically apply to site-built components, but I will still look at it to see if there are any issues with it. A factory built-chimney will be inspected much like the stove and the flue with regard to adherence to clearance and installation methods. A critical element of the chimney installation its height above the roof. A chimney that is too short can be subject to down-drafts caused by wind blowing over the roof. We use the 3-2-10 rule to evaluate the height of chimneys. It must extend more than three feet above the roof surface, and it must be two feet higher than any part of the building that is within ten feet of the chimney. Once the inspection is complete, I create an inspection report which outlines all the critical details about the components, installation, and clearances. An antique wood stove which is too close to the adjacent wall. Note the discolouration on the wood caused by pyrolysis. Homeowners often find these requirements frustrating, especially if they are told that the system needs to be altered. Many people simply don't understand what the big deal is when they've never actually noticed a problem. Which brings us back to the quote at the top. 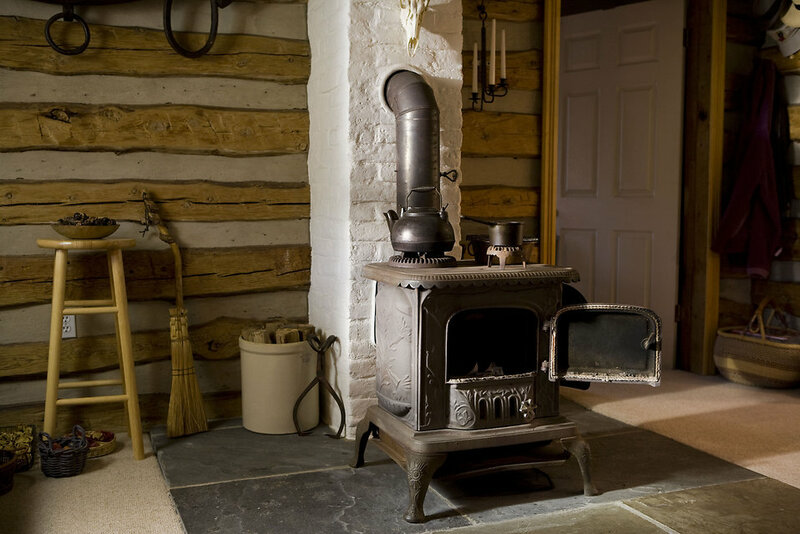 Yes, an improperly installed wood stove can be used for many years before a problem arises. As it heats the home, it is also heating up adjacent walls, sometimes more than it can safely endure. Even if the stove isn’t heating the wall hot enough to burn right now, it can be actively lowering the wall’s combustion temperature through a process called pyrolysis. Over time the chemical structure of wood is altered and it’s combustion temperature is lowered. This is why an improperly installed wood stove burning for 20 years could ‘suddenly’ cause an adjacent wall to catch fire. This is one of the things I am trying to prevent with these inspections. So are WETT inspections mandatory? No. There is nothing requiring a wood-burning appliance to be installed by a WETT certified technician or to be WETT inspected afterward. However, if you have a wood stove in your house, your insurance company will very likely require you to have a WETT inspection to satisfy their underwriting guidelines. If you do not provide a WETT inspection report, they could exclude your wood stove from insurance coverage or even cancel your insurance policy. Most of the time, it is the home insurance company who is asking for the inspection. Even if an inspection is not required, I would urge you to have your wood stove inspected regularly for the sake of the safety and security of your home and your family. Ultimately, that’s why these inspections are important and why I offer them as a valuable service.